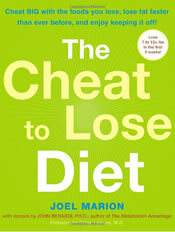 Cheat To Lose is a diet set out in a book by Joel Marion. The Cheat To Lose approach gets more deeply into earlier dieting principles of aerobic and strength training and high-protein small and frequent meals. What is the Cheat To Lose Diet? Cheat to Lose aims to manipulate the level of the hormone leptin – this naturally falls when calorie intake drops as happens in most dieting regimes, thereby restricting the tendency for the body to keep burning fat, so weight loss slows or stops. Marion’s objective is to increase the leptin level, and since Leptin supplements are not available, he claims that an increase of caloric intake boosts leptin and ‘tricks’ the body into resuming weight-loss – in fact suggests that a single day of overfeeding or ‘cheating’ restores leptin levels and the resumption of weight-loss activity. This is the ‘cheat day’, when you can consume foods “you crave without feeling guilty” – or so says the book. Each week begins with two low-carb days, followed by an increasing Glycemic Load on each of 4 days, finishing with a ‘cheat day’. The idea is to manipulate leptin levels in order to maximize fat loss. Daily exercise is recommended, including suggested strength or resistance training, and the book includes ideas and tips, many medical references, suggested meal plans, and recipes. Some supplementation is recommended by the author. These exercises can be used with the Cheat to Lose Diet. Other high protein recipes can be found here. Glycemic Index and Glycemic Load are two DIFFERENT thing. My Cardiologist has me following a Glycemic LOAD scale not the Glycemic Index scale. Which is a big pain because there is way more info about Glycemic Index. would like more information. Great diet. i wanna know wat is GI/GL stands for???? i am interested in this diet,but the exercises included strength or resistance training?because i don’t have equipment ,i could make cardio but resistance exercises withouth equipment how?